Previous Post Don’t speak with your mouth full Dominic! spooky & morbid. like my ear goo. you win. Thank you Calvin, always interesting to hear what people think particularly when I put forward ideas that deal with the more uncomfortable issues in life. I really like this. 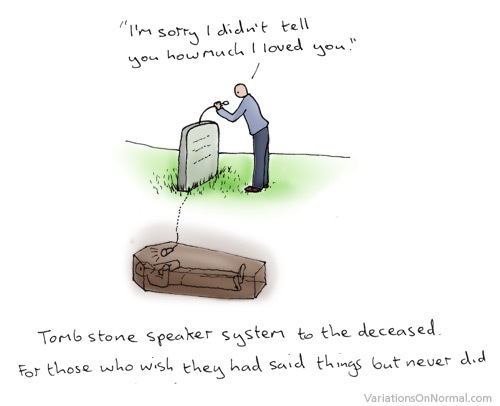 My boyfriend would definitely go for it on the proviso that, before his death, he could record some responses so that occasionally – but not always – it would reply. ha! I like the ‘but not always’ bit, makes it more natural. I guess if you don’t believe in religion or spirituality then you can trust in technology. If only this actually would work…very clever and also very soulful.